Vital Remnants: Will #MikePence be any help to cultural conservatives? Will #MikePence be any help to cultural conservatives? Trump has picked a running mate who, when confronted by alpha-male bullies in corporate boardrooms who want to impose their will, will acquiesce. 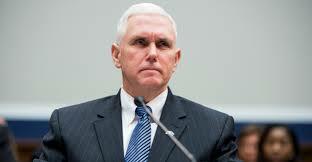 Trump, an alpha-male corporate bully in his own right, must have seen what Pence did when big business ganged up on the state of Indiana over religious liberty, and then decided he was a man with whom he could easily dominate. They deserve each other. So, vote for Trump if you like — he’s still the better choice for people who only vote on the Court — but don’t do it because you think Mike Pence will be of any help to religious and social conservatives. I'll be posting later on why social conservatives need to break entirely with big business "conservatism." The mega-corporate world has broken almost completely with cultural conservatism. It is now, almost without exception, the enemy. And the sooner social conservatives see that, the better off they will be.